"A phrase coined by Elaine on the TV show "Seinfeld." 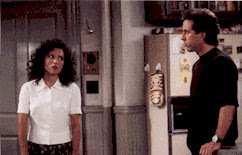 Refers to Elaine's favorite kind of birth control that was ultimately taken off the market. Elaine bought all the remaining stock she could get her hands on and then hoarded her stash of sponges. She defined her dates as being "sponge-worthy" or not. Jerry- I heard you went out with Bob last night. Was he sponge-worthy? Or alternate response from Elaine-I don't waste my sponges on just anybody. He has to be sponge worthy, Jerry!" Remember this Seinfeld episode? Well, I feel the same way about my homemade Pesto Sauce that Elaine felt about her sponges. There's consequences if you use it and there's consequences if you don't. So using my homemade Pesto Sauce is a serious decision. I only have so much Pesto in my freezer and when it's gone, it's gone! Is the dish good enough for my pesto sauce? Down the road when my pesto supply has been depleted will I say to myself "shouldn't have done it"? What if next month I find a fabulous pasta recipe and I don't have enough pesto? These are just some thoughts I had when I was considering making Tyler's Mozzarella Grilled Cheese. The sandwich sounded very interesting, and if I ate a grilled cheese every day for the rest of my life I'd be happy, but I just wasn't sure if it was "sponge worthy". Toast pine nuts in a skillet over medium heat until fragrant, about 5 minutes. Combine pesto ingredients in a food processor and pulse until well combined but still rough-textured. If you have a panini press, turn it on to warm up; otherwise, set a cast iron skillet over medium heat. Assemble sandwich by smearing insides of bread slices with pesto. Arrange a layer of sliced tomato and season with a few turns of fresh pepper. Layer the mozzarella slices over the top and then place another piece of bread on top to make the sandwich. Drizzle olive oil over skillet's surface and place sandwiches on the hot skillet or panini press. If using a skillet, place another heavy skillet over the top to form a "press". Turn after 2 to 3 minutes and replace weight. The sandwich is ready when golden brown and mozzarella has melted around the edges. Please stop by and check out the rest of Tyler's Fans at Tyler Florence Fridays! Tasting Notes: Mr. Tastebuds was not happy when I told him we were having Grilled Cheese Sandwiches for dinner. But then I told him I was making potato chips and he'll eat anything as long as I make him some homemade potato chips. Well, he loved this sandwich and specifically said I should make it again! Grilling the sandwich in EVOO was wonderful and made a fabulously crisp crust! But I'm still on the fence if it was sponge worthy or not. However I do think Tyler's Mozzarella Grilled Cheese would have been delicious served sometime in July when my basil is in full glory and made with a warm-from-the-sun homegrown tomato! YUM! Now that would be a very sponge worthy sandwich! You are too funny! I saw the title for this post and thought, is she talking about Elaine's sponges? And sure enough you were :) The sandwiches look amazing, my husband grumbles at grilled cheese most of the time but I love it. Your homemade pesto sounds wonderful, do you share the recipe? LOL!!! It was fun writing this post! My Homemade pesto sauce is about the same as Tyler's which is listed in the above recipe. I use more garlic though and sometimes I use pecans instead of pinenuts. Hee, hee! TFF brings out our inner Mae West, that's for sure! LMAO- How funny. Sponge-worthy, I so enjoyed that show! Your sandwiches are a must try for me, they look fabulous! I loved that episode - well, actually, I loved almost all of them - and at first I thought maybe the bread was spongy or something like that. 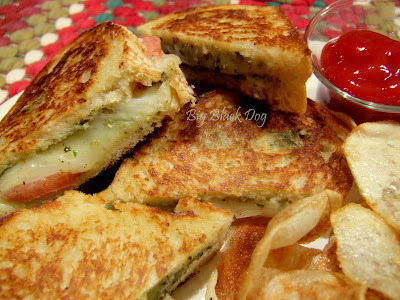 The kids love grilled cheese so this is a recipe I'll have to try. I did buy a paninni grill, keep forgetting to use it! i might not ever think of "sponge worthy" the same now without thinking of pesto and mozzarella also. lol. i've had my eye on these sandwiches for a while now. One of my favorite episodes and oh so quoteable. I use "splurge worthy" a lot when trying to determine whether to eat something bad for me and it came from sponge worthy. The sandwich looks great! YUM! I love your reference, and I must agree: this sandwich looks totally sponge-worthy. How wonderfully delicious. I can't wait to try it! Each year it seems I debate the pesto supply too, never seems I've harvested enough! Congrats!!! On your "1st Year Old Blogging Anniversary"
LMAO - 'Sponge Worthy' is one of my favorite Seinfeldisms. So what you are really saying is that next year you need a much bigger basil garden and to make alot more pesto? We're big fans of grilled cheese at my house. I'm ready for a twist! This looks delicious. These would be perfect too, as I'm making my first homemade pesto for a recipe next week. I'll have to save a little back. I can't wait to grow some basil this summer, then I'll be freezin' mine also. Love the Seinfeld reference...we still watch the reruns around here...LOL. Your sandwich looks amazing and I wish I had it right now! Right. Now. Mr. Tastebuds loves potato chips...Mark is an absolute potato chip fan...he gave them up for Lent as he did not want to give up the TWD desserts (he has always given up desserts and eating between meals for Lent in the past)...this potato chip deprivation is taking it's toll...LOL...he is roaming around every night asking why on earth he gave those up!